It doesn't matter which experiment generator you use to run your computer-based Psychology experiments the Black Box ToolKit USB response pad with voice key helps improve your millisecond reaction time (RT) accuracy. Truly plug in and play as our USB response pad appears to your computer as a second keyboard and each button press produces a standard key press. Each voice response also produces a key press and RT! Fully customizable with between 1 and 8 buttons in a range of colors and sizes to suit your needs. Hand-held external buttons also available. Ask us for a quote now. Simply plug into a USB port on your PC/Mac/Linux system and our response pad will appear as a second keyboard. Press a button and a standard keystroke will be sent to your experiment. Finished in an attractive carbon fiber effect our response box houses up to 8 buttons in a range of colors and locations. What's more if your participants make a vocal response this also produces a standard key press and TTL event mark or TTL trigger! Simple to use and simple to setup with tunable vocal activation, or crossing threshold. It's your choice whether to use it as a standard response pad or use it as a voice key. *Remember although our USB response pads hardware is millisecond accurate and helps reduce RT variability in your experiments it cannot automatically correct for any mistimings that are inherent within the experiment generator or other hardware you use. For self-validation you should independently check the accuracy and consistency of your experiment generators presentation and response timing, or system as a whole, with a Black Box ToolKit v2 together with a BBTK USB response pad. For sub-millisecond TTL event marking of stimuli and responses, you should combine our response pad with a mBBTK v2. The unique mBBTK v2 takes over all timing duties from any experiment generator so you can be 100% sure of your presentation, synchronization and response timings. Compatible with all Psychology experiment generators, e.g. E-Prime, SuperLab, Presentation, Inquisit, DMDX, ERTS, DirectRT, PsyScope, PsychoPy etc. 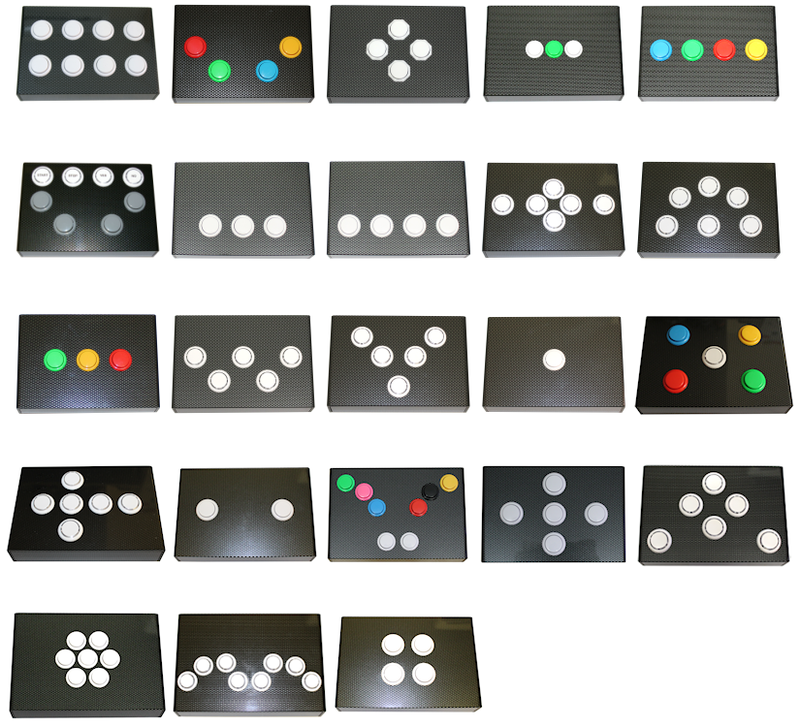 A range of colored buttons are available to order. Clear cap buttons allow you to put your own labels under a tamper-proof clear plastic cover. Simply unscrew the button, remove the clear cap and place your own label under the button top (21mm dia). Clear cap buttons are available in a range of colors. The key cap is always clear to enable your participants to see your label underneath. Smaller diameter buttons are also available on request. You can customize your button layout by electing where to place between 1 to 8 buttons. Lid measurement 202mm length x 137mm width. 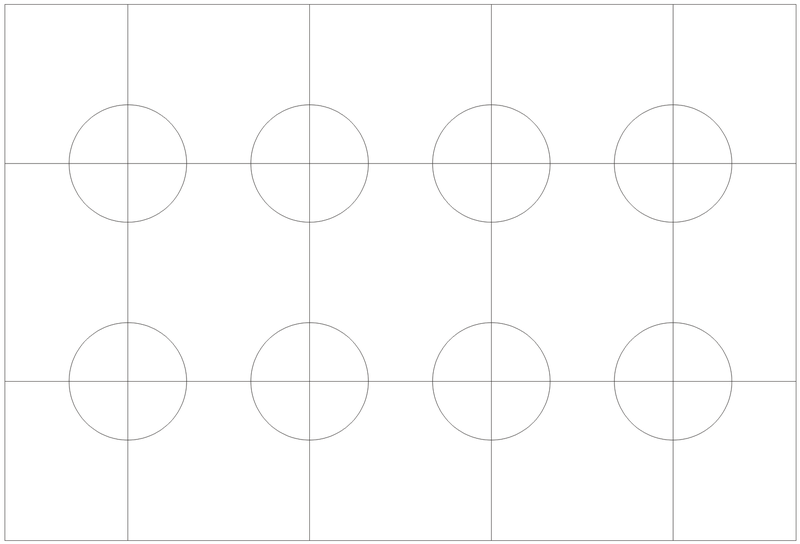 To help we have provided downloadable templates you can use with your favorite drawing package to customize your layout. Send us your layout and we'll make it to your design. Alternatively give us a sketch and we'll send you a PDF proof of your design for approval. Nothing could be simpler! 8x TTL A dedicated TTL line for each button that operates with sub-millisecond accuracy for TTL event marking/TTL triggers. Active high for the duration of each button press. Ideal for +5 V TTL event marking/TTL triggering of true individual button response times or for time audit, e.g. in EEG, connection to a BBTK etc. 8 bit port. Sensitivity Enables you to set the activation threshold or sensitivity for the voice key, i.e. crossing threshold. Increase or decrease the volume/crossing threshold required from your participant to trigger the voice key and produce a keystroke. (3.5 mm stereo socket) Allows you to plug-in the BBTK headset with condenser microphone or your own desktop or lapel mic. Used to accept a vocal response rather than a button press within your experiment. (3.5mm mono sockets) Up to 4x external buttons of your own can be used. When you connect your own push-to-make buttons via the 3.5mm sockets these work alongside the corresponding response pad buttons. Participants can press either your external button or our response pad button to make a response. (USB 'B' square socket to PC 'A' flat) Connects to the PC you want to accept responses on. Each button sends a standard key down response as might a normal keyboard if you pressed keys 1-8 for example. (2.5 mm stereo socket) When any button is pressed a 50 ms wide TTL pulse is sent to this socket. This can either be a positive or negative pulse depending on which signal line you use. For simple event marking of true response times or for time audit, e.g. in EEG, connection to a BBTK etc. (female 9-way D connector) 4x TTL lines connect to the BBTK via this connector. If you are using a BBTK v2 when you press a button a +5 V TTL event (onset, duration and offset) is captured by the BBTK for time audit purposes. When connected to the BBTK v2 if a button is pressed a keystroke is sent to the computer you are running your experiment on. Simultaneously a TTL event marker is sent to the BBTK which logs the button press in terms of onset, duration and offset. It is also possible to use these +5 V signals to event mark on EEG and for time audit purposes. #This can add 25 ms to key down durations and 250 ms to voice key durations – onsets or RT's are unaffected as these are sent to the host PC immediately. ALL standard keyboards, other response boxes and voice keys typically have longer debouncing periods or silence windows. 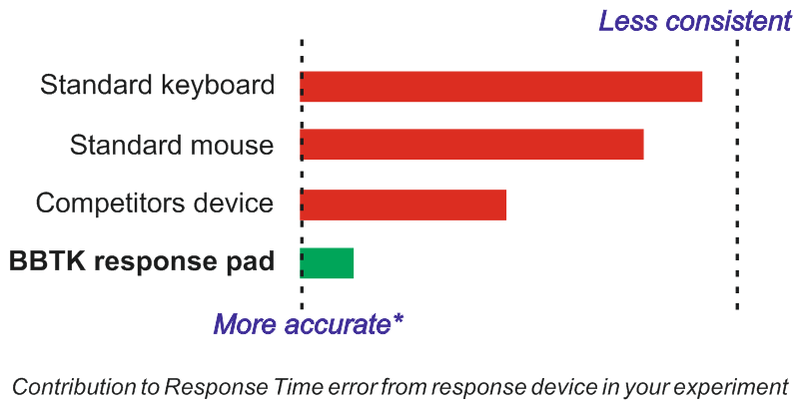 *Remember although our USB response pads are millisecond accurate and help reduce RT variability in your experiments they can't automatically correct for any mistimings that are inherent within the experiment generator you use. Hardware capable of sub-millisecond accuracy. Timing accuracy tied to PC or experiment generator used.